Status and trends: In July 2016, ADF&G (2017) estimated the herd to be 22,630 caribou (range: 20,074–25,186) which is a 69% decline since the peak size of 70,034 (10% SE) in 2010. The decline was first measured in 2013. The rate of decline 2010 to 2016 was an exponential rate of -0.193 which is a halving rate of 4 years. Caribou abundance was low in northwestern Alaska in the mid 1800s through the early 1900s and began to increase by the 1920s (Mager 2012). Numbers were inadvertently supplemented by domesticated reindeer which had been introduced in the 1890s to the Alaskan North Slope (Mager 2012).When the herd was recognized in the mid-1970s, it was estimated to have 5000 caribou. By 2002, the herd numbered 32,000 and 70,000 by 2010 which is an annual overall rate of 10% increase over 35 years. 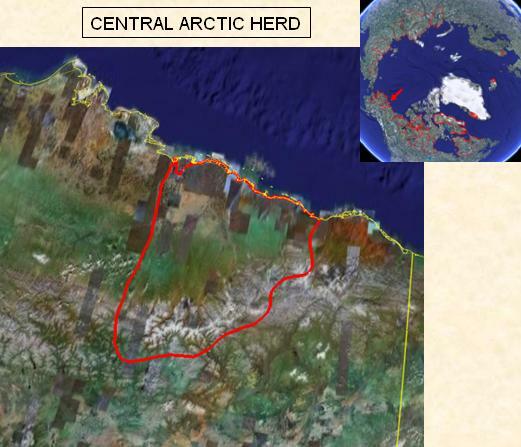 Ecology: The Central Arctic herd calves along the wetlands and tussock tundra of the coastal plain and summers also on the coastal plain and the foothills and winters south into the tundra of the Brooks Range. Predators (wolves and golden eagles) are few near the coast near the coast (Murphy and Lawhead 2000). Wolf predation is higher when the caribou winter on the south side of the Brooks Range as wolves are more abundant. The calving, insect relief and summer foraging ranges are within the Prudhoe Bay and Kuparak oilfields which have progressively spread 160 km along the coast. The oilfields have about 480 km of gravel roads and pipelines (Walker et al. 2014) and started producing in 1977 when the 1,300 km oil pipeline and the 666 km Dalton Highway were completed to central Alaska. The highway is bounded on either side by a 8 km corridor where hunting is restricted to bow-hunting. Off-road vehicles within the corridor are not allowed within the corridor and so most hunters used highway vehicles and aircraft for access. Since the 1980s, oilfield activity has displaced some calving to reduced habitat quality leading to reduced fitness and calf survival (Cameron et al. 2005, Arthur and Del Vecchio 2009). Caribou were seen to deflect from or hesitate to cross under the elevated pipeline sections during simulation studies in the 1970s (Lawhead et al. 2006). By 2003- 2007, and based on GPS collars, caribou cross the highway and elevated pipeline during fall and spring migration (Nicholson et al. 2016). Climate: The climate on the Central Arctic herd’s calving and range is more continental than the WAH and TCH to the west in Alaska. The calving and summer climate is modified by proximity to the coast and the CAH has above average number of plant growing degree days in June and a relatively high summer drought index as July precipitation is relatively low. The winter ranges in the Brooks Range has an average number of days with freezing rain and rain-on-snow days (CARMA unpubl. data). Significant trends (1989-2016) include more plant Growing Degree Days in June and July, increasing precipitation in July , an increasing mushroom index and warmer temperatures in October. Severe events include an exceptionally late spring in 2013 resulting in high mortality of adult females (33%) in May 2013. Monitoring: Herd size is monitored every 2-3 years using modified aerial photo-direct count technique which depends on weather causing caribou aggregate in large groups. Adult and calf survival and productivity are annually monitored as well as distribution and movements. Adult survival declined between 2007 and 2010, with annual rates being 83-87% but then declined to 75% 2012-2014 (Lenart 2015). Pregnancy rates and calf survival were high 1997-2010 at >85% and >50 calves:100 cows in the fall, respectively. Harvest is annually monitored through hunter reports or hunters registering their harvest. By 2011, the total harvest doubled to about 1000 caribou in 2011-2012 harvest-year as the herd increased and the bag limit increased from 3 to 5 caribou. The harvest rate was 2-4% and increased to 5% 2013-2015 as the herd declined (Lenart 2015, ADF&G 2017). The increase in harvest may also have followed a federal closure on Western Arctic caribou ranges which shifted hunting the CAH’s range through the access created by the Dalton Highway. Management: The causes of decline are unclear although the late spring in 2013 contributed and after 2013, the harvest was likely unsustainable which accelerated the rate of decline. The cumulative effects of 45 years of oil development and the Dalton Highway on the caribou are unclear. Initially herd management was to minimize effects of oil development mostly through avoiding pipeline and road alignments that could block movements and maintain a low harvesting rate of <3% adult cows. The Alaska Board of Game in 2004 set the intensive management objectives for 28,000–32,000 caribou and harvest of 1,400–1,600 caribou. After the herd declined the management recommendations were to reduce the harvest to 3% of the 2016 estimate by reducing non-residents from 5 caribou to 2 bulls, and reducing the resident cow season by 31 days (ADF&G 2017). Arthur, S. M. and P. A. Del Vecchio. 2009. Effects of oil field development on calf production and survival in the Central Arctic herd. Alaska Department of Fish and Game, Federal Aid in Wildlife Restoration. Final Research Technical Report. Grants W-27-5 AND W-33-1 through W-33-4. Project 3.46. Juneau, Alaska, USA. Lawhead, B., J. P. Parrett, A. K. Prichard, and D. A. Yokel. 2006. A Literature Review and Synthesis on the Effect of Pipeline Height on Caribou Crossing Success. Lenart, E. A. 2015. Units 26B and 26C caribou. Chapter 18, pages 18–1 through 18–38 [In] P. Harper and L. A. McCarthy, editors. Caribou management report of survey and inventory activities 1 July 2012–30 June 2014. Alaska Department of Fish and Game, Species Management Report ADF&G/DWC/SMR-2015-4, Juneau. Cameron, R. D., W. T. Smith, R. G. White, and B. Griffith. 2005. Central Arctic caribou and petroleum development: distributional, nutritional, and reproductive implications. Arctic 58:1-9. Murphy, S. M., and B. E. Lawhead. 2000. Caribou. Pages 59–84 [In] J. C. Truett and S. R. Johnson, editors. The natural history of an arctic oil field – Development and the Biota. Academic Press, San Diego, California. Walker, D.A., Raynolds, M.K., Buchhorn, M., Peirce, J.L. (eds.) 2014. Landscape and Permafrost Changes in the Prudhoe Bay Oilfield, Alaska. Alaska Geobotany Center Publication. University of Alaska Fairbanks, Fairbanks, AK, AGC 14-01: 84pp.